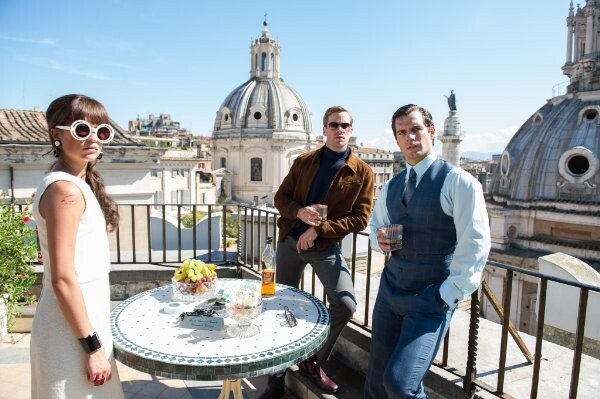 Guy Ritchie, fresh off his Sherlock Holmes movies, continues his trend of period pieces by bringing us a new incarnation of “The Man From U.N.C.L.E.,” a TV show made and set in the 60s. The film version is set in the 60s as well, and everything from the clothes to the lighting is clearly aimed at putting us in that time.. You don’t need to have seen the show or even lived through the Cold War to have fun with the movie, though – Ritchie wisely opens the film with a sequence making it perfectly clear how well the West and the Soviets got along at the time. Our protagonists Napoleon Solo (Henry Cavill) and Illya Kuryakin (Armie Hammer) could not be more different. Napoleon is a suave, unflappable former criminal and blackmailed-into-serving American CIA agent. Illya is a KGB agent with a penchant for enraged outbursts and a tendency to solve things with his considerable strength. When they are assigned to work together by their respective handlers, neither is particularly game – they half-destroy a public restroom at their initial meeting because they recognize each other from a past encounter, one which involved them not only working against each other, but each one trying to kill off his opposite number. Their assignment, once they stop fighting, is to work with Gaby (Alici Vikander), the daughter of a German scientist who appears to have been kidnapped by criminals. Since this is a spy movie in the vein of James Bond and “Mission: Impossible” (whose soundtrack was pretty obviously a heavy inspiration to the composer for “The Man From U.N.C.L.E.”), things don’t go simply. Since this is also a comedic riff on those classics, there’s plenty of self-aware silliness, and there’s a bit of buddy movie warmth thrown in for good measure. Ritchie successfully walks the tightrope between trying to recreate an existing work and splitting off too far from the source material. The colors, fashion, vehicles, and so on are all appropriate to the period (Gaby’s outfits once they’re undercover are spectacular), and even the color balance of the film is reminiscent of film and TV from the 60s. Napoleon is a standard suave lady’s man from the era, down to his accent and line delivery. Fans of the show may find the new Illya to be too different from the original, who was wildly popular when the show was on the air. There’s plenty of action, from the extended chase sequence in the film’s opening through gunfights and speedboat chases and to the explosive finale. It’s not gory at all – one more way in which it settles itself firmly into the 60s – and for viewers who miss that era’s ability to do action without relying on blood getting everywhere, it will be a lovely reprieve from Hollywood’s R-rated action flicks. Those who prefer their gunfights messy and those who just aren’t interested in spy flicks will find their time better spent elsewhere, but for fans of the show, fans of Guy Ritchie, and people who like more intrigue and less blood, “The Man From U.N.C.L.E.” is a must-see.